One of the nicest hostels, I’ve ever been to. The staff was super nice and helpful for finding good spots in Prague. Everything from the beds to the washing rooms was very clean and well maintained. I defenitely recommend this hostel! 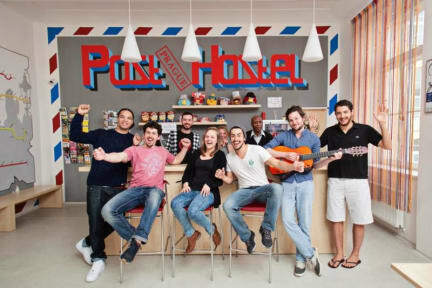 It's definitely the best Hostel we ever went to. If you're coming to Prag and looking forward to stay in a clean and well located place with very friendly and welcoming staff then this one should be your choice! It's not directly in the centre but we were thankful because of the very good public transport nearby. With this, we were able to see the whole city with it's places of interests and at the same time enjoying our relaxing neighbourhood with affordable restaurants and bars. Coming again! Ich war 3 Nächte da und Hostel ist einfach super. Ich empfehle für alle wer nach Prag kommt. Freundliche Mitarbeiter und gute Atmosfere, sehr sauber. The hostel itself is in a very good location. It took us three minutes by foot to get to the next station. The staff was very friendly. Our room was the one directly opposite of the kitchen so we always heard when people talked or cooked which was not a problem for us but for people who have trouble sleeping it might be a bit too noisy. The bathroom was always very clean but unfortunately the only one for four rooms which was annoying in the morning. But we enjoyed our stay anyway. was a little out of season, so it was not so much traffic in the hostel. The common area is really nice with a kicker and PS4. Was a little bit dissappointed because the people weren´t really interessted in meating other people. So maybe the Stuff could do more to get together all the people. But the Rooms are very nice, with curtains and very clean! The hostel was very nice. The staff was friendly, the beds were comfortable and the room was clean. The hostel is not located in the very center but in a nice neighborhood with a lot of restaurants and it was still easy to reach the city center quickly. The Hostel in total is nice. Staff is friendly and the rooms are really big. Unfortunately the bathrooms are not clean. Lage war leider sehr weit außerhalb vom Zentrum. Mitarbeiter waren nett aber nicht besonders zuvorkommend. Sauberkeit war leider auch nicht wie erwartet. Insgesamt hätte ich von der allgemein positiven Bewertung sehr viel mehr erwartet. Das Café auf der gegenüberliegenden Seite hat meinen Aufenthalt dort jedoch sehr versüßt und ist zu empfehlen.